Sort of continued from A Brief Trip Report from Guiding El Tapir and Quebrada Gonzalez One Day and the Poas Area the Next..
As it turned out, hitting sites from the Central Valley and the Poas area was a much better idea than birding on Irazu. 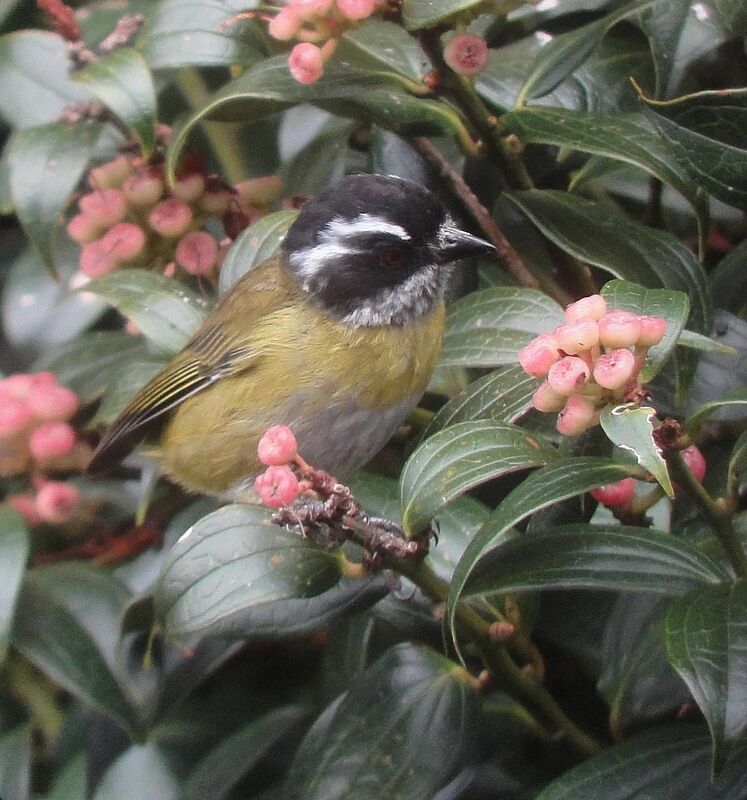 Sure, we sacrificed sightings of the junco and wren and missed a few other species that we would have probably gotten at Irazu but also saw probably 50 more species than we would have ticked at the larger volcano. The day began once again at the Bougainvillea and after a quick breakfast stop at the 24 hour McDonald’s in Heredia, we drove on through the empty streets to an area near San Joaquin that has coffee bushes, brushy fields, and a good number of birds. 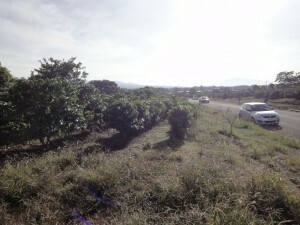 Coffee fields where we had the ground sparrow. Upon arrival, we were greeted by flyby flocks of Red-billed Pigeons (in the Central Valley, more common than the good old feral Rock Pigeon), flocks of White-winged Doves, a flock or two of Crimson-fronted Parakeets, and a nice bunch of other birds. The best was actual looks at two toughies- Crested (Spot-bellied) Bobwhite, and after a fair bit of waiting and watching, a Prevost’s Ground Sparrow! As with any quail like bird, the bobwhite is typically tough to see while the ground sparrow is just all too uncommon and skulky. Those were our “best” birds but we also saw Rufous-capped Warbler, Grayish Saltator, White-tailed Kite, Boat-billed Flycatcher, and two surprise Orange-fronted Parakeets among other more common species. A nice look at a Boat-billed Flycatcher. The dawn drive through small town streets was pretty birdy and we eventually got hoped for looks at Blue-crowned Motmot perched on a roadside wire, a Hoffmann’s Woodpecker, and a surprise Black-headed Saltator (seems this Caribbean slope species has become established in various parts of the Central Valley). 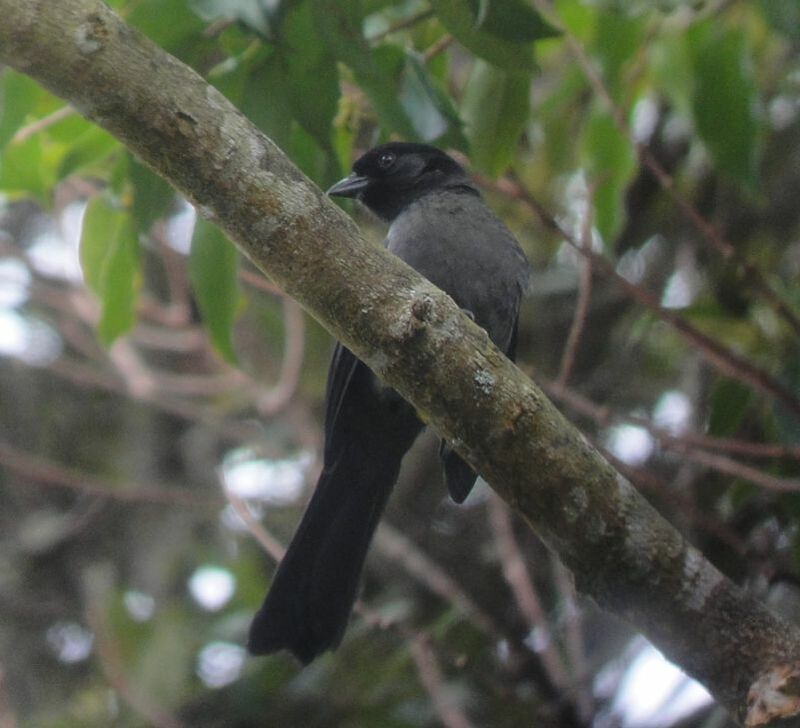 Those fine sightings were followed by the drive up the curvy road to Varablanca with a few stops en route to try for various highland species including the likes of Orange-billed Nightingale Thrush, Yellowish Flycatcher, and other species of the upper Central Valley zone. During one stop, spishing produced a bonanza of migrant warblers including a year bird- Townsend’s Warbler! The hoped for toucanet failed to show but we still had plenty of time to connect with that little green toucan. Happily, we hit a jackpot of birds at our next stop, a riparian zone that featured a fine mixed flock of highland birds. 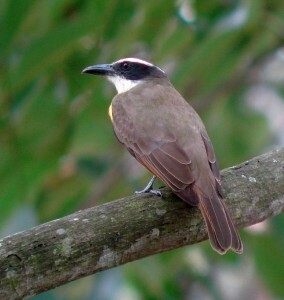 In a matter of minutes, we got both redstarts, Ruddy Treerunner, Red-faced Spinetail, Spot-crowned Woodcreeper, Yellow-thighed Finch, Ruddy-capped Nightingale Thrush, Mountain Thrush, Volcano and Scintillant Hummingbirds, and others. It’s so nice when the birds show! A Yellow-thighed Finch hiding its yellow thighs and looking very blackbirdish. Further on, the other riparian zones were quiet but we were in for a bunch more birds for the day, the next ones being Yellow-winged Vireo, Slaty Flowerpiercer, and Gray-breasted Wood Wren behind the parking lot of a small shop in Varablanca. It’s always worth it to keep an eye open for birds at the Varablanca crossroads because I have seen everything from Prong-billed Barbet to Golden-browed Chlorophonia, Emerald Toucanet, and even Yellow-bellied Siskin in that area. Although I knew that road work was being done on the road that leads to the La Paz waterfall, I still hoped we could hit a few spots on the way down. That didn’t work out due to heavy vehicles parking in the spots where I usually stop so I decided that we should bird a bit along the turn off to San Rafael. This turned out to be a good choice because it yielded our two target regional flycatchers- Golden-bellied and Dark Pewee, finally glimpsed Chestnut-capped Brush Finch, saw Brown-capped Vireo, and saw at least two Emerald Toucanets! 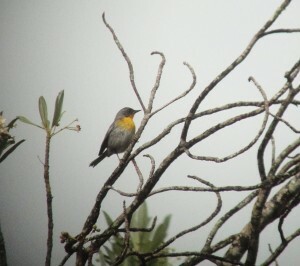 We heard but did not see Tufted Flycatcher and got a few other highland species. After that stop, we drove back uphill and went to the Volcan Restaurant to check the quality riparian habitat and hummingbird feeders before lunch. As usual, the guy who watches the cars there told me about seeing quetzal that morning. Since he is there most of every day, he sees one or two as they move through the riparian corridor and sometimes sees Black Guan as well. 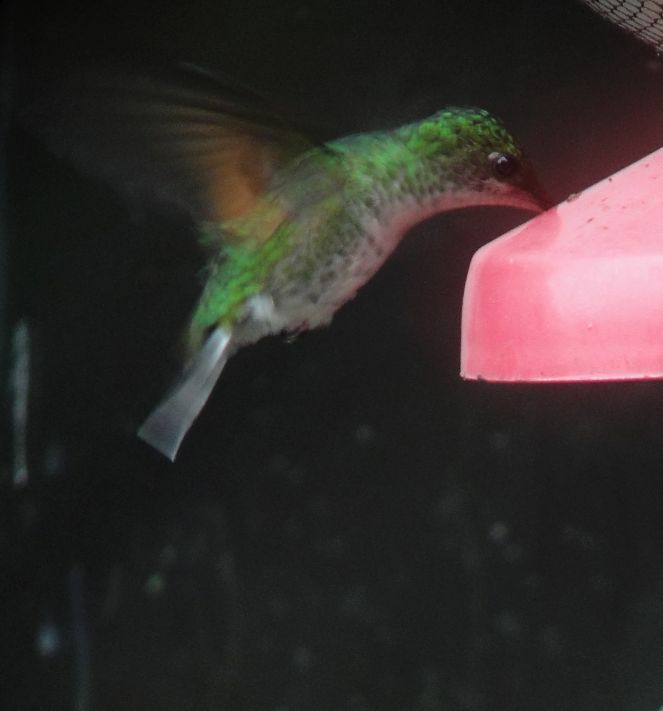 It was way more quiet than normal while we were there but the feeders complied with Violet Sabrewing, Stripe-tailed Hummingbird, and five other species of hummingbirds. This is a good site to pick up Stripe-tailed Hummingbird. Lunch was delicious as always and eating early gave us more time to look for birds in the higher elevations (and hopefully see them before the afternoon rains). Although it turned out to be the busiest day for traffic I have ever seen on Poas, we still saw most of our targets. The big ones like the guan and quetzal evaded us but I’m not sure if there were that many around because I didn’t see any of the fruits that they usually feed on. However, we did get fine looks at Black-cheeked Warbler, more Collared Redstarts, Yellow-thighed Finches, and Slaty Flowerpiercers, Black and yellow Silky Flycatchers, Flame-colored Tanager, Golden-browed Chlorophonia, and Flame-throated Warbler. We also picked up a new hummingbird for the day in the form of several Fiery-throated Hummingbirds, glimpsed a Wrenthrush, saw our third nightingale thrush for the day (Black-billed), and finally got our Large-footed Finch. A distant look at a Flame-throated Warbler. A closer look at a Sooty-capped Bush Tanager. We had lots of those. By the time we saw the finch, it started to rain too much to keep watching birds so we began to drive downhill with the hope that we could evade the falling water. As luck would have it, as we drove away from Poas and towards Barva, the rains came to a brief stop and we picked up a few more choice bird species. Scanning the canopy of distant trees from an overlook turned up scoped views of Long-tailed Silky Flycatcher but our best and most unexpected species was a Bicolored Hawk! Although it stayed long enough to scope it, it didn’t stick around long enough to digiscope it, otherwise I would show you its contrasting dark cap and Cooper’s Hawkish shape.